Bundle o Joy Articles To travel or not to travel? 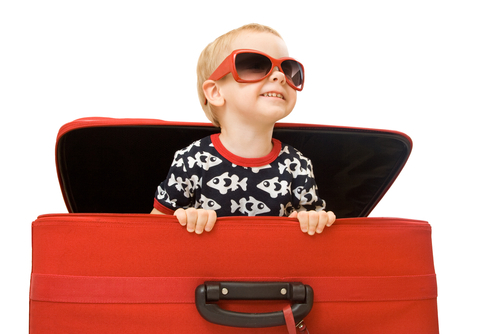 …A frazzled mum is travelling on her own with two small children, one a baby, one a toddler. She is struggling through the airport with both kids, nappy bag, carry on and too many other numerous things to count. It takes absolute ages for the plane to board, at which time the children become more fractious and annoyed before even taking off. They sit on this plane for over an hour, only to be told there is a delay and they will need to get off for approximately an hour. They get off the flight (keep in mind they have no buggy at this point) and are then told that they must go back on the plane to get their stuff. Despair. She is first saved by an extremely nice couple who helps them out immensely by grabbing all of their stuff and bringing it out, at which time they are told that there will be a four hour delay. They are then saved again when a very kind passenger takes pity on the mum who is looking more and more crushed as the bad news unfolds…he invites them into the first class lounge to wait during the delay – mum is saved for the next few hours until she has to re-board and do it all again! True story, and I have to say, not even near the worst travelling story I’ve heard! Some other classics include…being thrown up on mid-flight with no change of clothes, a 10 hour delay with three children (one a new-born who was very thankfully being breastfed). Even though flying with a new-born can seem very daunting, it is often the easiest way to travel with kids. Once they are mobile, it does get a lot more difficult. Breastfeeding is the easiest option, as everything you need is completely portable and gets through security! Small babies can be easily held for hours upon end, and staff are usually helpful enough if they see a sweet little new-born baby. – Wheels, wheels and more wheels – the more you bring that can be pulled, the better. Try these Trunkis for the bigger children. – Don’t travel with an expensive buggy. It will more than likely get ruined (or not show up altogether) and then you will have no buggy for your trip! Get a cheap stroller or buggy which will be much easier to transport and you won’t stress if it gets broken. – Car seats – bring your seat if possible onto the flight as you will then have it with you for any car journeys (no small thing). It can be near impossible to book a taxi with the proper car seat, that isn’t completely disgusting or for the total wrong age child. And if you’re hiring a car at the other end, car seat hire can really add to the price! – Look into baby websites which arrange things for you on the other end. I’ve never used one, but have heard that they can save the day. – Passport – get it as soon as possible and pay for the fast service! I have heard of people having to cancel trips due to passports that didn’t arrive in time. They are not sympathetic to this as a reason to refund you. – Travelling with baby food / formula etc. Much easier to breastfeed (bring cover) but if you are bottle feeding, work out how many you will need and bring extras in case of delays. I took formula to Canada and then had to switch whilst there because we ran out, then they didn’t have the same one there! Check the airline’s policy with regards to bringing baby food in your carry-on. I have had a few arguments over baby food with some extremely unsympathetic airport staff (which did NOT end in my favour). – Going to the toilet can be extremely tricky if you are travelling on your own with baby. I suggest you smile sweetly at other passengers (or staff) to make friends so one of them will hold your baby whilst you go to the loo! – Bring entertainment for the baby, but don’t pack all their toys. I have found filling a small treasure box with toys worked a charm. – Calpol is another essential and can be bought in those small, travel-size sachets. – Do not rule out being thrown up on. ALWAYS bring a change of clothes (or a few) for the baby as well as for yourself! Do you have any travelling stories to share? Any other tips / suggestions for ways to make flying with a baby easier? Please share! !